COSLYS Organic Lily Face Mask purifies and rejuvenates normal and combination skins. The formula contains white clay to absorb impurities and yogourt powder to smooth your skin. This intense skincare leaves your skin soft and supple. Using Coslys Face Mask is like having a facial at home ! 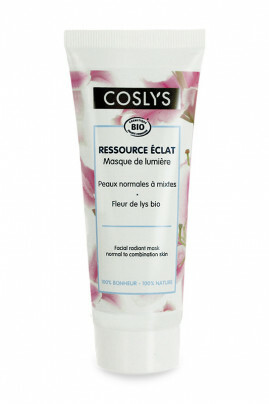 Apply Coslys Organic Purifying Face Mask in an even layer on your clean dry skin. Avoid the eye contour area. Leave it for 5 to 10 mn then rinse with clear water. Use once a week. Aqua (water), kaolin (white clay), spiraea ulmaria flower extract* (organic meadowsweet floral water), anthemis nobilis flower water* (camomile floral water), bentonite (clay), glycerin (vegetal glycerin), galactoarabinan (antioxydant), yogurt powder, lilium hybrid flower extract (lily extract), lilium candidum flower extract* (organic lily extract), rosa rubiginosa seed oil* (organic musk rose oil), parfum (100% natural fragrance), bisabolol (active from candeia oil : brazilian tree), lactic acid (pH regulator), tocopherol (natural vitamin E), glycine soja (soybean) oil (non OGM soybean extract), benzyl alcohol (conservative), dehydroacetic acid (conservative), potassium sorbate (conservative), sodium benzoate (conservative), citric acid (pH regulator), limonene, linalool (components naturally present in the fragrance).